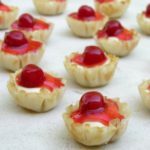 Bite-sized cherry cream cheese pies in little fillo shells. A great finger food dessert for parties and showers. In a medium bowl, beat cream cheese with a hand mixer until fluffy. Add sweetened condensed milk and beat until smooth. Add lemon juice and vanilla and stir or beat to combine. Transfer mixture to a large zip top plastic bag. Cut one corner from the bottom of the bag to make a small hole. Pipe the mixture into the fillo shells. Refrigerate for 1 to 3 hours. Top each with pie filling. Enjoy!